Along with the music of Alfredo Casella I count that of Lars-Erik Larsson among my most significant ‘finds’ of recent years. BIS set the standard with a number of fine recordings, several of which have been favourably reviewed on these pages. Now it’s CPO’s turn, with a new series devoted to the composer’s orchestral music. The first volume, also with Andrew Manze and the Helsingborg Symphony Orchestra, was such a revelation that I simply had to make it a Recording of the Year (review). As much of a discovery was the fact that this British-born conductor, usually associated with baroque and classical repertoire, was just as adept at modern and contemporary works; his recent recording of pieces by Thomas Adès is ample proof of that (review). As for Larsson's symphonies – he only wrote three – my comparative versions of Nos. 1 and 2 are by Hans-Peter Frank and the Helsingborg band; that album dates from 1988/89 (BIS-426). CPO have chosen to separate these two works, throwing in very decent fillers for good measure. Indeed, if the experience of Volume 1 is repeated here these pint-sized pieces should be just as enticiing as the quart-sized one. The recording promises to be excellent, too. 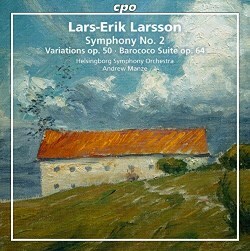 Larsson’s Second Symphony, written in 1937, divided critical opinion in Sweden to such an extent that the composer decided to withdraw the piece after its première. Unusually, he reworked the final movement into a separate work called Ostinato, which he introduce at the ISCM Festival in Warsaw two years later; the symphony had to wait for a radio broadcast in 1973 before it could be reassessed and rehabilitated. Set in three movements Larsson's Op. 17 has a neo-classical feel, albeit with a thread of irreverence that one would be hard-pressed to find in, say, Paul Hindemith’s works of the period. It’s that lovable urchin quality, all tousled hair and scraped knees, that makes Frank’s account of this symphony so enjoyable. He gives the opening Allegro con moto a bounce and brio that the reined-in Manze can’t match. Also, Frank’s delicious pizzicati and tramping rhythms are more clearly articulated than Manze's. Not only that, his punctuating brass and ongoing asides – we seem to be eavedropping on a conversation here – have added impact when they’re framed with such wit and warmth. CPO’s recording is very refined and nicely detailed, whereas the BIS one is rather bright; that said, when it comes to joie de vivre Frank gets my vote every time. Honours are more evenly divided in the Andante, but again it’s Frank who infuses the music with greater animation and interest. The sonorities in this central movement may hint at Hindemith, but there’s an underlying lyricism here that’s most endearing. Manze is alive to that, but he tones down the wild March-Scherzo that erupts at 5:01; it’s almost as if he's not quite sure what to do with it. In any event I much prefer Frank’s invigorating and unabashed way with this tangential tune. Oh dear, I seem to be focusing on the earlier recording at the expense of the later one; then again I do like the fact that Frank lives more dangerously than Manze does. That said, both conductors give pithy accounts of the Nielsenesque Moderato – Prestissimo. As Christoph Schlüren points out in his extremely detailed liner-notes Larsson lacked confidence is his ability as a symphonist; indeed, he withdrew all three of his symphonies after their initial performances. Listening to Manze’s account of the First and Frank’s of the Second it’s hard to believe that the composer had so little faith in these very accomplished works. Happily he was less pernickety about his other orchestral pieces; just as pleasing is the fact that Manze lavishes as much care and attention on these than he does on the symphonies. One only has to sample them to realise how well crafted and rewarding they are. The Variations for Orchestra encapsulates what Schlüren calls ‘the free 12-note style of Larsson’s maturity’. The key word here is ‘free’, for although the piece has a certain rigour it’s not without moments of skittish humour. These Swedish players are certainly adept when it comes to digging out fine detail; the exposed string figures are especially well executed and those brass interjections are as piquant as one could wish. In fact Larsson’s Variations has a clear, unambiguous narrative that belies the work’s structural preoccupations. Manze ensures that everyone is ‘on message’ at all times; as for the recording it draws out all the score’s nuances and distinctive timbres. The wittily titled Barococo suite finds the composer at his genial. eye-twinkling best. Ditto the conductor, who brings a gentle charm and elegance to the mix; that’s mirrored by playing of exceptional plaiancy and character. In short, this is joyous music-making; indeed, the concluding quadrille and galop – complete with its catchy rhythms and a raffish side-drum – sounds just like a fizzy overture by Offenbach. It’s all great fun, and one senses that everyone is having a jolly good time. Not surprisingly I revisited Barococo several times during the course of this review, admiring it more each time around. I might well prefer Frank’s ebullience and energy in the symphony, but it’s the beautifully worked fillers that tip the balance in Manze’s favour. These new performances are helped in no small measure by CPO’s sensitive engineering. I auditioned both the 16-bit download and the SACD, and while the latter sounds wonderfully natural and airy the former isn’t far behind. Schlüren’s liner-notes, which include timed cues and a wealth of biographical detail, are a welcome bonus. Hans-Peter Frank may have the edge in the symphony, but Manze has the advantage of two gorgeous fillers; the CPO sound is excellent.